"I screwed up really big on this." 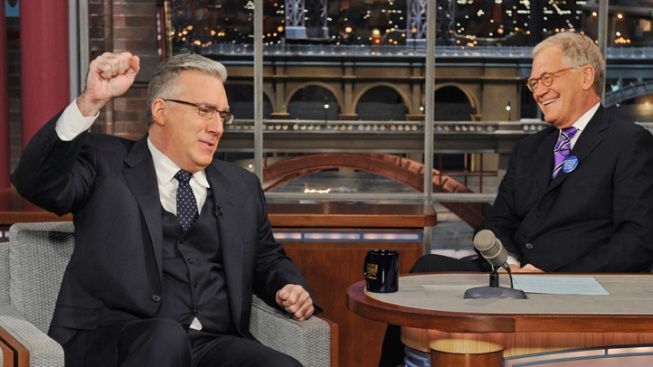 Olbermann discussed his abrupt departure from Current TV on "Late Show with David Letterman" Tuesday night. Less than a week after Keith Olbermann was suddenly fired from Current TV, the firebrand political commentator addressed his ouster on CBS’ “Late Show with David Letterman” Tuesday night. “It’s my fault that [“Countdown”] didn’t succeed in the sense that I didn’t think the whole thing through,” Olbermann told Letterman. Olbermann—who stands accused of breaching his contract, attempting to sabotage the network, and repeatedly failing to show up for work—appeared to peg the failure of “Countdown” on the shortcomings of Current TV, a small public-affairs network launched seven years ago by former VP Al Gore and business partner Joel Hyatt. “I didn’t say, ‘You know, if you buy a $10 million chandelier, you should have a house to put it in. Just walking around with a $10 million chandelier isn’t going to do anybody a lot of good, and it’s not going to do any good to the chandelier,’ And then it turned out we didn’t have a lot to put the house in, to put the chandelier in, or a building permit, and I—I should have known that,” Olbermann said. Letterman sought to clarify the extended metaphor. "You're the chandelier?" Letterman asked. Olbermann said he was. Olbermann’s acrimonious exit from the small channel echoed his 2011 split with MSNBC after nearly eight years at that network, where he helmed the original incarnation of “Countdown”—and scored top-tier Nielsen ratings. Although Current executives intended to make Olbermann the centerpiece of their fledgling operation, the embattled host reportedly clashed with higher-ups on numerous occasions, most prominently during early coverage of the 2012 U.S. presidential election campaign. According to Olbermann, though, tensions ran high even earlier in his short-lived tenure. Olbermann claims he soldiered on for the sake of his staff. “I had 25 people who—most of them came with me from other jobs, one guy was with me from four different places, and they put their careers at risk for me,” he told Letterman. When Olbermann was pushed out of his job last week, he promised to take legal action against Current TV. According to The Associated Press, Olbermann will be represented by the lawyer who secured a reported $45 million severance package for Conan O'Brien during the infamous 2010 "Tonight Show" kerfuffle. “Countdown” was promptly replaced by a new show hosted for former New York governor Eliot Spitzer.